I received the product below for review purposes. All opinions are 100% mine and no compensation was received for this review. I am a big fan of personalized gifts because they are one of a kind and they are usually a gift idea that can be used for many, many years! And for gift ideas for men and Dads this Father's Day, personalized gifts are a great idea for that hard-to-buy-for, has-everything Dad in your life! Need some great ideas? Head over to MemorableGifts.com, a premier provider of personalized gifts for all occasions: holidays, birthdays, weddings, graduations, & anniversary gifts, and, of course, Father's Day gift ideas! At MemorableGifts.com, they take pride in providing and creating personalized gifts for all occasions and events. The splendor behind personalized gifts is giving something thoughtful and one-of-a-kind for your loved ones. Why are they so special? It's because they have the utmost understanding of how meaningful it is to give a personalized gift, for personalized gifts are treasured for a lifetime. Their cutting edge technology in design and laser engraving will ensure that every detail on your gift, from the initials to the name etched on the Engraved Gifts to the heartfelt memo you give to them to be placed on their elegantly designed cards. I had so much looking through their AMAZING selection of personalized gifts! They had so many options and I had trouble choosing a gift for my hubby! Should I get him a personalized barware item, BBQ item, garage item, or desk accessory? There were so many great options but I finally settled on the Personalized Crystal Desktop Business Card Holder for my husband's desk since he really needed somewhere nice to store his business cards on his desk. And I am so glad I chose this because my husband LOVES this business card holder that we received from MemorableGifts.com! 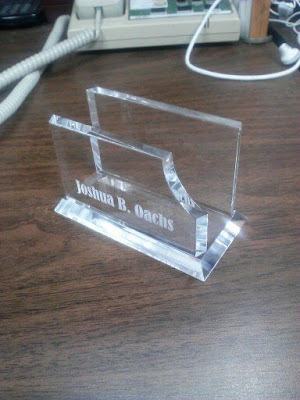 This personalized crystal business card holder stands for true professionalism. It is a gift that practically ensures more business. There are not many things you can give a professional to show them how much you care about them and their business, but this is definitely one of those perfect gifts that will work well to say both. The lines on this crystal business card holder articulate the true essence of an executive, they are clean, crystal clear, and there is no mistaking the professional identity of whom you are dealing with. Business cards are a necessity in the professional world, and having a place to store them is even more important-crumpled in your pocket is not a viable option. This unique desktop business card holder is more than perfect for that hardworking businessman, savvy businesswoman, or new professional in your life. Let them know how much you care about who they are and what they do by giving this elegant gift. 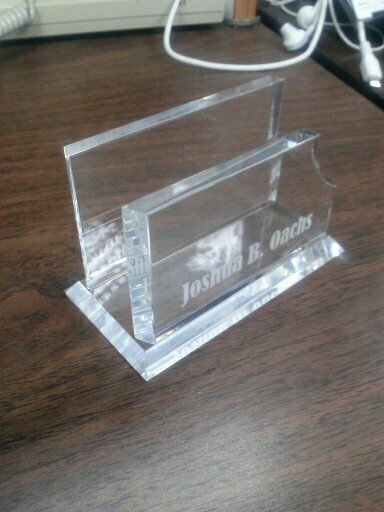 The optic crystal business card holder measures 2 3/8" x 4" x 2". It is the right size for a desk of any importance. Having the full name laser engraved on this personalized crystal gift is sure to impress even the most discerning professional. The engraving of my husband's name turned out perfectly and clearly and it looks really professional. 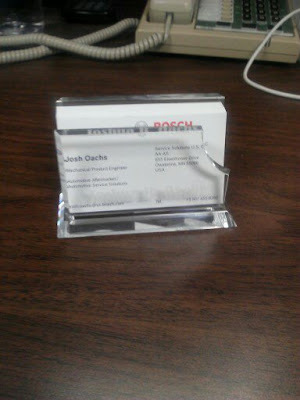 The crystal material is very durable and professional looking and my husband is now proudly displaying his name and business cards on his desk at work! This was a perfect gift for Father's Day because it shows our appreciation for all his hard work supporting our family financially and also reminds him how proud we are of him every time he looks at it! It is a gift that will last for many years and can be used even if he switches jobs! So if you are trying to shop for a hard-to-buy-for Dad this Father's Day, then just head to MemorableGifts.com and turn your imagination into lasting memories with personalized gifts from Memorable Gifts. Win It: Memorable Gifts is generously offering (1) $25 gift certificate to a lucky winner!